Have you observed any boosts in ranking that were date-coincident to signing up for BBB? Thanks, Erick. Good vignette, BTW. Date-coincident: no, simply because there’s a lot of dust flying (other links, citations getting fixed, site getting tuned-up, etc.). But in other ways I’ve observed the BBB link as a very good one. Signing up for and being approved by the BBB will give you a great link only to the extent that Google crawls and indexes it. My company was approved over a month ago and so far it does not appear that Google has given me credit for it. There’s a delay. I had a client who waited 2 months for BBB to get the page (and link) up. But there’s no harm in prodding your BBB rep, which I suggest you do. Oh the BBB site and link is up however Google has not indexed the link yet and given me credit for the link. 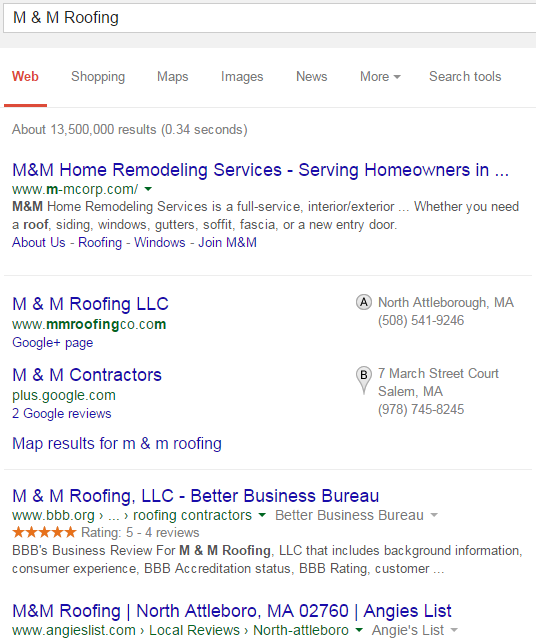 When you get approved for BBB it will take some time before Google crawls it. Exactly, good call Andy. 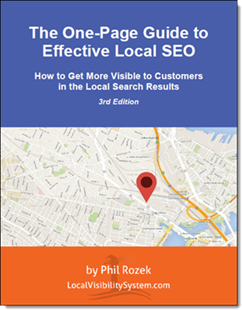 You can do it from their Google+ business page and you can also load up important citations you want for recent reviews on the business owner’s personal Google+ page that controls the business account. Often end up seeing nice jumps in reviews and maps because the local eco-system is pretty slow on its own. Ahrefs uses different metrics, of course, but I actually prefer it. Also, it’s one of the few sites that gets approved for the review extension in Adwords. Thanks, Mark. That’s good to know. I’ve never been able to get the review extension to work for “local” reviews. Dana DiTomaso told me it can be done, but is finicky. Have you found that BBB reviews always get rubber-stamped for use in the extension, or they’re just more likely to be approved? Great to know. Thanks, Mark! You make a decent Case Mr. R.
I am a bit of a hater on the BBB for reasons that have been well-publicized, and don’t believe there is nearly as much consumer trust in it as there once was, but you didn’t really argue there was, so. Curious about that Page Authority. I tried half a dozen random BBB pages, and didn’t find anything that high. Checked both accredited and non, 6 of each. The only one I found later on with 60, was one I had spammed to death for a ORM case. So from a link value (not citation value) stand point, I am not so sure. Anyways, love your posts as always. No one puts out more consistently awesome local content than you. HT, HT, HT. Could you paste in an example link? Here is a mix of accredited and not. This was a whole new search, and I should mention of the 8 BBBs I looked at, one was PA 47, and the other 80. Interesting. Obviously, non-accredited businesses don’t get a “follow” link, but how their pages are low-PA is a mystery to me. Still, I agree that the link doesn’t need to have high PA to be good. If doing background checks on businesses, resolving disputes, working with the Gov, Media and consumers to prevent scams is boring. Than Guilty as charged! Phil, you should pay your BBB a visit and walk in their office and see what they do on a daily basis. I agree with John Smith – the BBB has helped me on several occasions over my years in business. Getting the right advice and help from some amazing men and women with valuable experience – for FREE! That’s great to hear, Steve – thanks for weighing in. 1) It may not only be a couple hundred dollars. They price things based on the number of employees that you have. For this reason alone I think it’s crazy to pay them. 2) I can get on the BBB site and get a rating without being accredited. A big mistake on their part if you ask me. 3) I already have the BBB logo and my rating on my site. It just doesn’t say Accredited. 4) It’s already there as a citation. I don’t have to pay them. Valid points, Chris. My point is simply that you can squeeze more benefit out of BBB – however much or little benefit there may be – if you get accredited. It’s not something that makes sense in every situation, of course. Just one more tool in the toolbox. Chris Auman, you are illegally using a federal trademarked logo then. John, as you probably know, a business can be listed and have a rating without being accredited. I think that’s all Chris is referring to. If that’s the case, he can use their logo on his site to showcase a listing for his own business – a listing that he may not have even created personally. Just like any Federal Trademark Logo, you have to have their permission to use it. That is one of the things you pay for when you join. Businesses actually sign a licensing agreement in order to use the logo. The agreement is there so businesses have to sign an agreement, stating they will not illegally, deceptively advertise with the BBB logo. He has not signed that agreement. Using the logo on his website insinuates that he is BBB Accredited and participating in an Arbitration program (which he is clearly not). The reason he is using it is because the logo has value to his consumers.. I have viewed his website. It clearly is posted there to look like he is BBB Accredited.. 100 % of the general public would see that and think, he is BBB Accredited. He is clearly trying to get something for nothing..
John, I just looked at Chris’s site. There is nothing deceptive about his citing the BBB. They give him an A+ rating, and he mentions the A+ rating. He’s not even using one of the “official” badges that are available only to accredited businesses. He doesn’t need the BBB’s permission to cite his own profile any more than they need his permission to list his business on their site. If someone’s simply linking the BBB logo to his BBB page and citing the rating that they gave him – accredited or not – that is OK both ethically and in practice. It is like saying you are an Alumni of a school that you attended (did not pass a class) and did not graduate from.. Sorry, hit POST COMMENT too soon. Meant to type. The BBB is a non profit consumer site that is used for a public information source. Another point.. He has the BBB logo and link under Associations/Awards on his site– He is NOT a part of the BBB “Association” and he has not won a “BBB award”… To me, that is him trying to be deceptive. The reason he is using the logo is because it has value and influences consumers decision. That may be true about the logo, John. Can you cite a specific law? 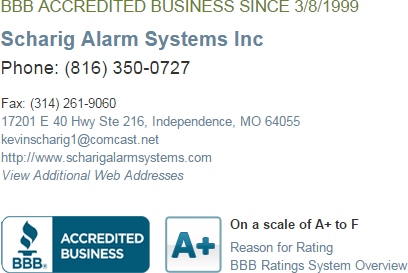 …it looks like a business can cite its BBB rating as long as it’s accurate and can be updated if the rating changes. Granted, I haven’t found the Central Ohio version of the above policy page, but I don’t see why it would be different. Again, Citing and using the Logo on your website are two different things. is the agreement businesses sign when they become Accredited. There is NOTHING in that agreement/policy that says a Non-Accredited Business can use the logo or cite anything..
My take is that the BBB intentionally keeps the rules vague (a la Google) so they can go after businesses on a case-by-case basis. I can’t imagine that the mere use of their logo is even a concern. I’ve only heard of the BBB taking legal action against businesses that claim they’re accredited but aren’t. Phil, Part of the background check the BBB does on business owners, is they look at Advertising, Licensing, Background check on ownership, Public records such as Bankruptcies, Government Action. Not every business is eligible . Why would the BBB want just anyone using the Logo? It would devalue it’s meaning.. You can’t expect the BBB to not want to protect their brand right? Let’s be fair..
Query, can BBB also be used for national businesses. We don’t have a physical brick and motor location. I can attest to the value of a BBB backlink. One thing to consider is that if your competitor has a BBB backlink, you will need a half dozen or more to offset their’s unless you also get one. It’s not required, but it’s a handicap if you don’t have it and everyone else does. And of course if are the first, in your market / niche, you’ll be the one the competitors are chasing trying to figure out why your site is so powerful. Just do it! My outlook is more: if your competitors have good links, you don’t have to get the same links they do, but you need to get good links somehow. The BBB may or may not be one of them. Does the info in this article still apply now that BBB links are no-follow? Sorry – I realize that my question was way too vague. 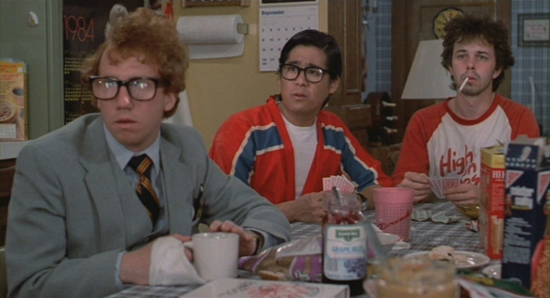 What I meant to ask was: Are BBB links still a RANKING factor now that they are no-follow. Thanks Phil! I doubt it. Some SEOs swear nofollow links directly help rankings. I’m not one of them, because I’ve just never seen evidence that nofollows help rankings. Who knows. In any case, there are still other reasons to consider becoming accredited. – You can mention on your website that you’re BBB certified (which builds trust). – It’s an SEO opportunity to add a general business description and (depending on the branch of the BBB you’re in), to add information about products/services. – It lets you add more categories (I’m assuming free listings don’t), so you can show up in more barnacle SEO opportunities. 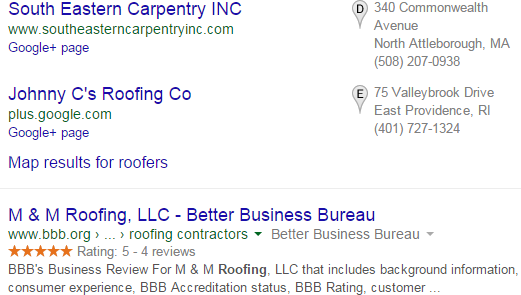 Example: BBB is #5 organic for “roofers dallas tx”. Being accredited gets you higher on the page.